In the first decade of the 20th century Europe was the centre of world political and industrial power. Many of the leading nations had overseas empires. While Britain remained the leading naval power, Germany, under Kaiser Wilhelm II, started building a powerful navy in the 1890s. France, Italy, Austria, the Ottoman Empire and Russian had navies based in Europe, while United States and Japan had growing naval forces in the Pacific. The launching, in 1906, of HMS Dreadnought (the first all big-gun battleship) immediately made every existing battleship obsolete, causing a new round of ship building. For many nations it was an expression of national prestige to have such ships, in spite of their great cost. Long standing rivalries and more recent events led to power blocks. The Triple Alliance (Germany, Austria-Hungary and Italy) and the Triple Entente (Great Britain, France and Russia) sought to deter attacks on member nations. At the same time, nationalist movements, particularly in the Balkans, challenged the old regimes of Austria-Hungary and the Ottoman Empire. The South African War (1899-1902), the Russo-Japanese War (1904-1905) and the Balkan Wars (1912-1913) added to tension and uncertain political relationships between various countries. Many editorials and commentators wrote about the possibility of a European war. 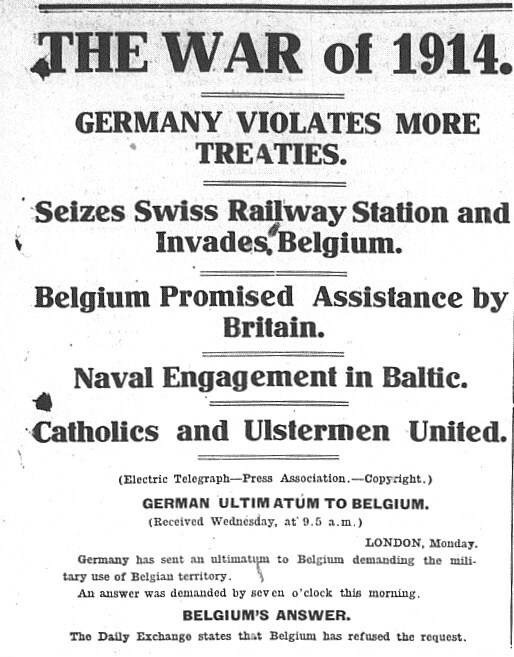 British newspapers usually saw Germany as the most likely aggressor, with her already-powerful army and growing navy. But the assassination of the Austrian heir Archduke Franz Ferdinand in Sarajevo on 28 June 1914, by Gavrilo Princip of the Young Bosnians, was not immediately seen as other than a local terrorist act. It was Austria’s excessive demands on Serbia, which was assumed to be behind the assassination, which led to an escalating crisis over the next weeks. Austria-Hungary’s declaration of war against Serbia on 28 July quickly saw the major nations mobilise their military forces, with Germany supporting Austria, and Russia and France supporting Serbia. Italy, although a Triple Alliance partner, remained neutral. The German invasion of Belgium, en route to attack France, was the trigger for Britain to join its Triple Entente partners at war. The British declaration of war against Germany on 4 August also saw New Zealand, as part of the British Empire, becoming a participant.